Last Tuesday--June 16th to be exact--Nail A College Drop Out turned four! Oh how they grow up so fast. *tears* So obviously, because this is a nail art blog, I've decided to celebrate with what else? Nail art. This li'l celebratory mani has a sprinkle of everything. There's a gradient, some water marbling, a hint of spectraflare, and tad bit of freehand. If the choice for the color scheme of this maniucure looks familiar, you've probably seen this mani from last summer, or maybe you've taken a look at the blog itself. This time around, I've axed the black and white glitter, then added some spectraflare. And because I can't never have enough neon, I had to through Urban Outfiters Gotta Have It in the mix as well. The pics taken inside my lightbox don't do the holographic loveliness any justice. UPDATE: Here's an Instavid of the holographic goodness in action. Ahhhh congratulations! Happy 4th! :D Love the signature colors! That is really pretty and creative. I am in love with all the nail styles you have on this blog - and Happy Anniversary! Congrats on year 4! Your nails look so good. It makes me want to run out and get a set so I can step my nail art game up. Congratulations! And lovely mani to celebrate! Wow..4 years of nail art blogging.Congrats! 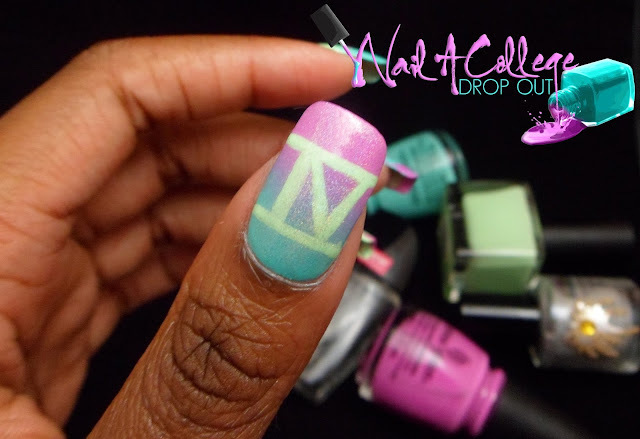 I love colors in your logo and this matching mani is perfect to celebrate blog anniversary. I can make out this is your fav. color, by the way mine too ;)!! Wow! Congratulations on four years! Your manicure is beautiful. I love the color combination and the sparkle. WOW! I love the color combo! you do an amazing job! Congrats. Congrats on four years and beautiful mani, as always! Congrats on four years! I love the mani you created for it. Very cute!! And congrats on 4years!!!! Love the mani and congrats on 4 years!! Wonderful! Congrats on 4 years! Thank you. This mani was surprisingly easy. thank you! i sketched it a month before hand and couldn't wait to do it! thanks! glad you enjoy them as much as i do! Thank you! I knew i wanted to stick with the colors in my logo, but felt the need to add a lil sumthin xtra!